Sam Alfredo Simonetta passed away peacefully at Mount Sinai Hospital, Toronto, on March 20, 2019 at the age of 63. Beloved son of Giuseppe Simonetta (Maria). Rejoined in heaven with his mother, Maria, and siblings Emilio and Filomena. Loving brother to Rosario “Roy” (Lora), Tony (Jerran), Ralph (Domenica), Anna (Maurizio), and Lisa and sister in law Liliana. 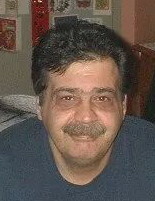 Left to mourn is his partner, Rose, and his children Maria (Philip), Joey (Michelle), Mary (Stephan), Patricia, and Tasha. Proud grandfather to Johnny, Selina, Sebastian, Gabriella, and Myia. Sam will always be held dear in the hearts of his loving nieces and nephews, relatives, and many friends. Sam held a passion for life – he could always be found smiling, whether in the garage or in the kitchen, and his larger than life personality will be greatly missed. Visitations will take place at the Cardinal Funeral Home Bathurst Chapel (366 Bathurst St.) on Sunday, March 24, 2019. The Funeral Mass will be celebrated on Monday, March 25 at 11:00 a.m. at St. Francis of Assisi Roman Catholic Church. Private cremation to follow. In lieu of flowers, donations to the Dorothy Ley Hospice, 220 Sherway Dr, Etobicoke would be greatly appreciated. Dear Anna and Maurice, I just learned of the news of Anna's brother passing away, please accept my condolences. So sad when a serious illness takes people from us, it is a solemn time. My deepest condolences to the Simonetta family, for loss of great human being. Our sincerest condolences to the Simonetta family. May Sam always Rest In Peace. My condolences to Joe and his family. Our deepest sympathies for your loss... Those we love do not go away, They walk beside us everyday, Unseen, unheard but always near, Still loved and very dear.